OTTAWA - The global economic upheaval is slowing growth in Canada, but Bank of Canada governor Mark Carney doesn't believe the country faces the prospect of its largest trading partner falling into recession. Carney told the House of Commons finance committee Friday that the United States is in the midst of its weakest recovery since the Great Depression, but he did not expect the world's largest economy to shrink. Both Carney and Finance Minister Jim Flaherty were called to testify before the committee after two weeks of frenzied trading on stock markets. "In response to uncertainties in Europe and the evidence of slowing global growth, equity and commodity prices have fallen significantly, and financial market volatility has increased markedly," Carney said. "The spillovers to Canadian financial markets have been less pronounced but are still notable." In its July monetary policy report, the central bank forecast the Canadian economy would grow 1.5 per cent in the second quarter, but the governor said Friday the bank now expects minimal growth or even a slight contraction in the economy in the quarter due to the global slowdown. "The considerable external headwinds that the bank has long identified are now blowing harder," Carney said. "Relative to our prior expectations, we expect somewhat weaker economic momentum globally and, as a result, in Canada." Flaherty said he will do what is necessary if the global economic slowdown hits Canada hard, but for now his budget projections remain on track. "We would act in a pragmatic way, as we have done successfully previously and recently," the minister told the committee. But Flaherty said the global economy continues to grow — albeit more slowly — and the results so far have been consistent with forecasts set out in the budget. "While Canada experienced greater than expected growth in the first quarter, that is expected to be balanced out by a softer than anticipated second quarter," he said. Mounting government debts in several European countries — including Greece, Italy and Spain — and the possibility that some could default on their payments, have been worrying global investors. There have also been fears that the slumping U.S. economy will squeeze Canada and undermine the government's deficit-fighting plan. The central bank governor sounded a more dovish note Friday than he had last month when economists said they expected him to look to start raising interest rates later this year. "To state the obvious, if the outlook for growth and inflation changes, the path for monetary policy will be affected accordingly," Carney said. CIBC World Markets senior economist Peter Buchanan noted that Carney and Flaherty both came down on the side of a slightly more optimistic forecasts for the global economy with their belief that the U.S. economy would not shrink in the near term. "Clearly there are more pessimistic views out there," he said. Earlier this week, U.S. investment firm Morgan Stanley cut its forecast for global economic growth for this year and 2012, saying the United States and the 17 countries that use the euro were "hovering dangerously close to a recession." 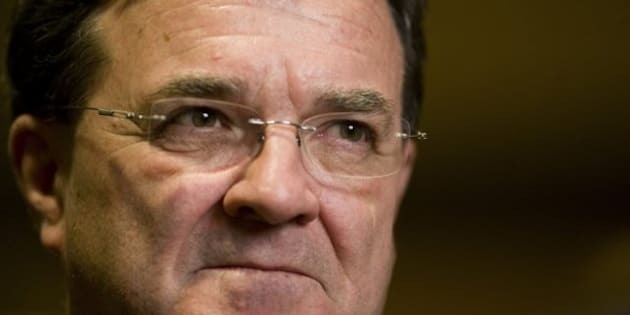 Flaherty said the current situation has been caused by a lack of confidence in efforts of governments to reduce their deficits and repeated his assertion to return Canada to balanced budgets by 2014-15 with the help of $4 billion in annual savings. Flaherty said more spending by the government was not the solution. "That actually is the problem in Europe, too much spending," he said. "It is exactly what we should not do if we want to maintain the fundamental fiscal health that we have in Canada,"
Liberal Scott Brison said the minister should have laid out a plan of what he would do if the U.S. did slip into recession. "I think this don't-worry-be-happy approach that he took in the fall of 2008 does not deserve repetition today, it was the wrong approach then and it's the wrong approach now," Brison said. The testimony by Carney and Flaherty followed a report by Statistics Canada that the pace of inflation eased in July as increases in the price of gasoline slowed. The consumer price index rose at a annual pace of 2.7 per cent in July, down from a 3.1 per cent increase for June, giving the central bank room to keep interest rates at their exceptionally low levels, economists said. It was the first time that inflation has been below a pace of three per cent since February.